Palmetto State Armory is proud to announce our new D&H 6.8 magazines. Made with a steel body and and magpul anti-tilt followers, these 25 round magazines are in-stock and ready to ship. Floorplate marked with Palmetto State Armory logo and "Palmetto State Armory, LLC". Body of magazine marked "0711 6.8"
Palmetto State Armory is proud to announce our new D&H 6.8 Gen2 magazines. Newly redesigned to function, and made with a steel body and and magpul anti-tilt followers, these 25 round magazines are in-stock and ready to ship. will these 6.8 gen 2 mags fit my pms 224 valkryie? BEST ANSWER: I purchased this mag to run .224 Valkyrie ammo. The fit and finish is excellent and runs flawlessly. Highly recommended. These magazines will fit in a regular AR-15 Lower? BEST ANSWER: Yes, they are for using a 6.8spc or .224 Valkyrie upper on a standard AR15 lower. yes they fit the standard AR-15 lowers and work great. BEST ANSWER: Yes the 224 requires the use of 6.8 spc magazines. yes the 224 Valkyrie will function just fine from these mags. Can these magazine be use for 450 bushmaster and 458 socom ? No they would need a different follower designed for a straight walled cartilage. I use stanag mags for my .458 with zero problems. The first 3 magazines full that ran through the rifle had failures to feed about ever 3-5 rounds. A little oil and 100 rounds later it has not miss-feed. Think it just needed some break-in. Great mag, well made, feeds well, no jams. Very good fit and finish. Excellent mag. 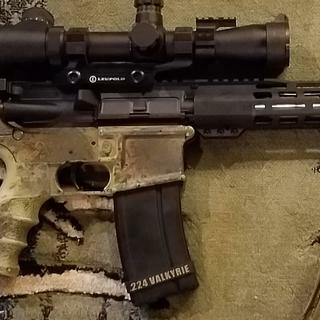 6.8 SPC mag runs .224 Valkyrie ammo flawlessly in AR platform. I find this clip to be a great value. 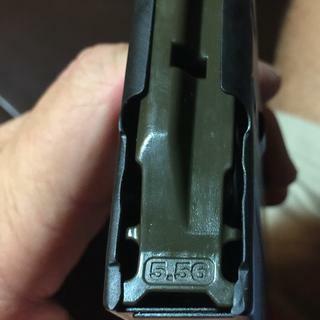 After arriving I was initially impressed with the quality of this magazine but after close inspection I found it had a clearly marked 5.56 follower although the mag body was also clearly marked 6.8 It’s my opinion that this is not a true 6.8 mag but a regular 5.56 mag made to look like a 6.8 at more than twice the price. I want to believe it was a quality control issue but not sure so just beware. We double checked our stock of those magazines and all of the ones we saw had the 6.8SPC follower. It appears that this was a mistake on D&H's part. Please contact Customer Service and we will be able to send you a replacement magazine with the proper follower at no extra cost to you. 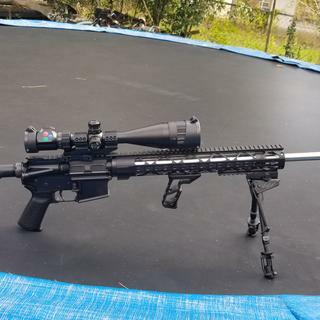 Works great with .224 upper. This mag fits well and works great quality for the price. palmetto has there stuff together. Metal mags are the only ones that work for the Valkyrie and these units do the job really well. The Magpul type when loaded with the slightly larger diameter 224 vs. the 223 spread and will not go in the mag well. D&H 6.8 Mags work great!! Unlike a couple of others who have reviewed these magazines, I have had no problems with them. They freely insert into the magazine well and drop free without any problems. I have both a PSA lower and a Aero Precision lower on my 6.8's and they work perfectly in both, there is no drag in either lower. I do have some 6.8 PRI 25 round magazines that do not hold open after the last round and they cost $45 each. I would recommend the D&H based on my experience. I would not waste my money on the PRI. Even at the regular price the D&H magazines are a great value. Thank you PSA for the great deals. I bought 8 of these on clearance so I got a great price. However I will not purchase any more at any price. They are a nicely finished magazines with a very good follower. Unfortunately the magazine body is just a little too big to permit speed reloads since it needs to be forcefully "pulled" from the mag well (empty or loaded). I tried all of them in 3 of my 6.8's with the same result each time. A couple thousandth's smaller and I would buy enough for every rifle. As-is they are relegated to target work only. Fit my Anderson mfg lower as smooth as any magpul d&h black Teflon coated or mil spec grey aluminum mags. A bit clunky slightly plain Jane ugly and heavy.....but worked perfectly with last round bolt hold open! A clear case of function over form buying more! I built my 6.8 using a 20" barrel from PSA Spikes Tactical upper and lower and an Anderson BCG. These mags are working fine. No FTF they hold the bolt open after the last round and they drop out when you push the mag release. They do just what they are supposed to do at a fantastic price of $9.99 each!! Needs a "zero" star rating but there's not an option for that. I purchased 10 of these PSA D&H 6.8mm magazines for $49.99 in January and put them away until now (May). Nearly forgot about them. Took them to the range today and tried them out. FAIL!! Didn't fit in either of my rifles POF and Noveske. Like the previous reviewer got stuck in the well. I inserted a loaded magazine into my POF and despite the very tight fit I gave it a hard tap. Big mistake on my part for sure! Got stuck about an inch of the way in. Bad stuck. Had to disassemble the magazine and smash in the middle of it on both sides just to remove it. Was actually very difficult not to mention embarrassing. On the plus side I had 10 "magazine shaped" targets to vent on and amuse myself with. Everything else PSA that I've purchased has been a very good quality product. Very Disappointed this time.